I am so excited about today! We’re bringing the Top 20 Moms to Follow on Pinterest to our blogs. You are in for a real treat, so grab a yummy drink and get comfy. Once you finish reading this fantastic post about Invitations to Draw from Anna (The Imagination Tree) click on over to Creative with Kids to see my take on what you can say that will make your spouse an even better parent. Each post will lead you to another until you are right back where you started. Anna has one of my favorite blogs. While her preschool and toddler posts are brilliant it’s her baby posts that really stand out to me. (Strange since I don’t actually have a baby. 😉 ) I wish I would have had access to The Imagination Tree Baby Play when M and M were little! I’m thrilled to be writing here at A Mom with a Lesson Plan today, as part of the 20 Moms article sharing day. 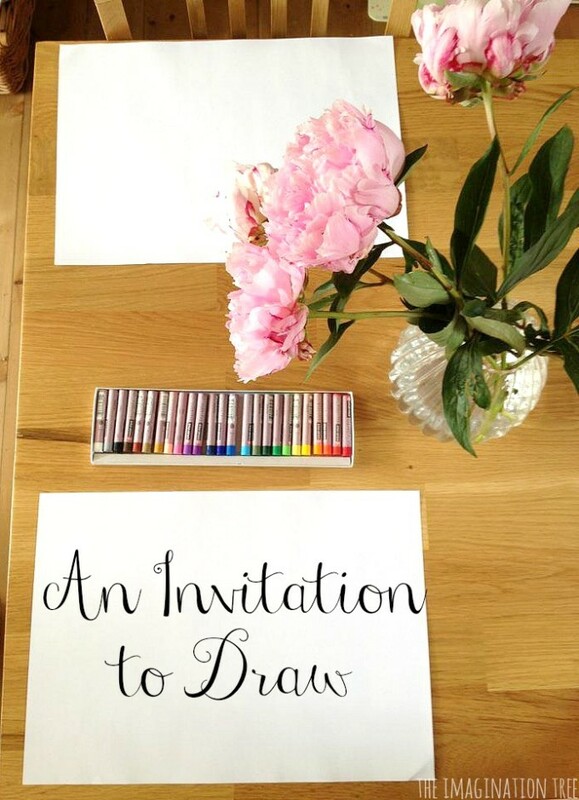 Create simple and inviting Invitations to Draw for children, by setting up a still life with flowers and accessible art materials to explore and experiment with. A totally open-ended art activity that encourages close observation of details, colour, form and line through wide open eyes and curiosity. In our home there are lots of little girls, close in age, full of energy and excitement who often become restless and in need of some calm and refocused play inspiration. When we are in those moments I often set out for them a very simple and open-ended Invitation to Play or Create, as a prompt to get them thinking and playing with a new combination of materials. Setting out a simple vase of fresh flowers such as these pink peonies (my absolute favourites) with two open sketch books and a set of new oil pastels, is such an inviting and calming table top activity, and yet takes just a few moments to prepare. In this instance my children were so excited to sit and start testing out the materials, and I tried my best not to become too directive as they explored. Often the answers are very different to their presuppositions and can result in quite a different drawing to the one they first started to make! Another day, another still life set up, this time using huge spiky lilies and simple colouring pencils, again with sketch books. By introducing a range of flowers and plants, a new focus can be made each time on shapes, line and form with comparisons made to the previous activity. It can also be wonderful to chart the progress that is made in a few months time by repeating very similar set up, and then comparing the two finished drawings. 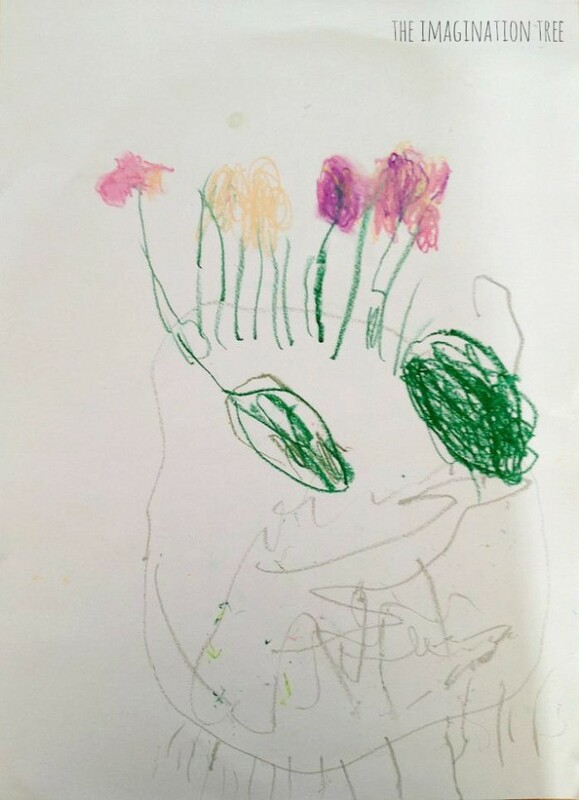 My 3 year old, for example, drew just random coloured lines for the peony still life invitation, but selected green to represent stems and pink for round scribbly flower tops by the time we looked at the lilies! I’m excited to chart her next steps over the coming months too. 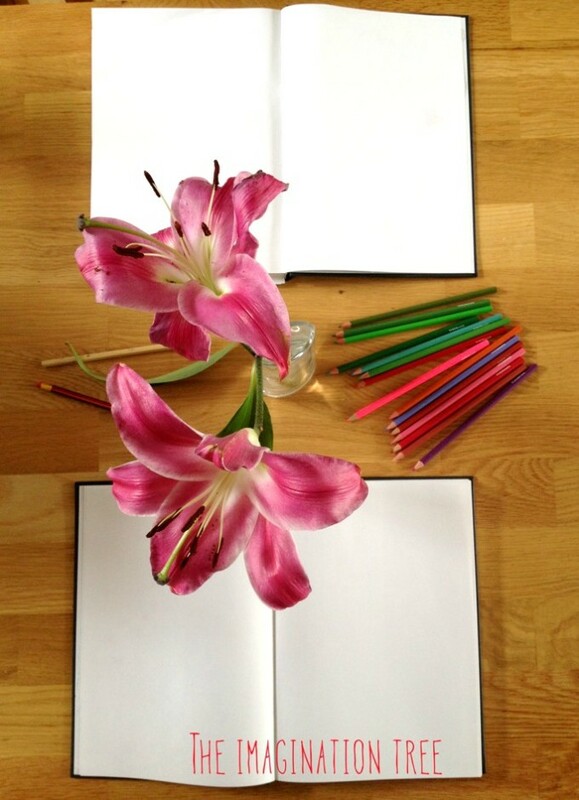 For more ideas about using sketch books with kids, Rachelle at Tinkerlab has a wonderful series called TinkerSketch with plenty of inspiration about materials and techniques to try. Why not try these other objects in a still life set up? Search The Imagination Tree for more art and creativity activities and Invitations to Play for little ones! Anna Ranson is an Early Years and Art teacher turned stay at home Mum, and writes The Imagination Tree, packed full of creative play and learning ideas for kids. Find her on Facebook, Pinterest and Google+, as well as part of the 20 Moms. Tell us what still life objects would work well at your house! Then head over to Creative with Kids... I want to share an important parenting idea with you!